I have just recently begun reading the Dystopian novels, and it is a genre I have enjoyed exploring so far! When I first heard about Eve, I could not wait to get my hands on it. The book starts off 15 years after the plague has already wiped out millions of people. 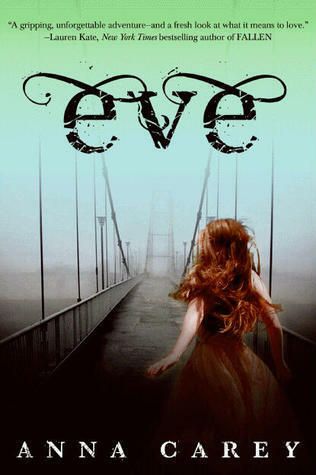 We are introduced to Eve and her safe little cocoon of a "boarding school". It is graduation night and when Eve thinks she is about to set off, learn her trade and live her life to the fullest, she is sadly mistaken. She learns very early on the true horrors that await her, and she does the most terrifying thing known to her. She leaves. One thing the author didn't do was sugarcoat anything. Her writing was raw and honest. She wrote the realistic life that would await you if a plague would take hold and rock the earth. There was blood and gore. The were moments of complete madness and then there were others that were beautifully vulnerable. Anna Carey painted such a vivid picture with her haunting settings and bold characters that I couldn't help but devour the novel. I was hooked! And Can I talk about Caleb for a second? He was so swoon worthy! He was written as a wild character. Messy hair, dirty clothes, riding horses. But he was fully equipped with a hilarious sense of humour and a sensitive side to match. Eve was a total win for me! The heart pounding storyline made for a thrilling read. And the wait for Book #2 is going to be a tough one! Totally loved this one too!